Malcolm found this little beauty in our garden today, although not sure how as she is not too bad at camouflage! The dragonfly was trying to find a safe spot to lay eggs near our pond! We think she succeeded, hope so as it is always lovely to see some wildlife in the garden. You see you don't have to go far to get some lovely photographs in the New Forest! 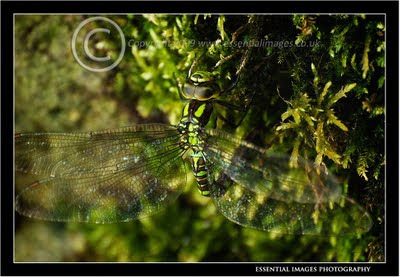 We think it is a Common Hawker (Aeshna juncea) Female! If you know any different, let us know!